Snapchat is, without a doubt, one of the most popular social media tools around today. Its use is so broad that it allows people to communicate about a seemingly infinite range of topics. While mainly an image messaging tool, many people use it to share their ideas and experiences with their friends and contacts all around the world. So how does this revolutionary app affect private jet charters? 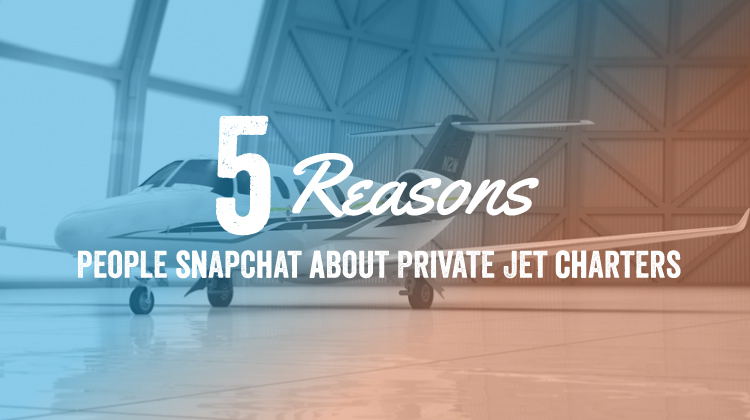 Below are a handful of reasons for why thousands of people are using Snapchat to share their interaction with the private jet charter industry as a whole. To promote their private jet charter business: Businesses are ramping up their advertisement efforts more and more on social media platforms like Facebook, Twitter, and Instagram. They’re getting some great results, so it’s not surprising that businesses are using Snapchat to promote their private jet charter businesses. It’s free, easy, and works just as well as other social media platforms! For fun: If Snapchat was just a communication tool, it wouldn’t be anywhere near as popular as it is. There’s a lot more to it than that, and the fun factor of snapping away on a luxury private jet can’t be ignored. With loads of tools and features to choose from, it’s a flexible app that not only serves a ton of needs, but also puts a smile on the face of its users and viewers! To communicate with friends: Snapchat has proven to be a popular communication tool, with many people using it to stay in touch with friends. Whether you want your message to be political, advertorial, funny, or just to show your friends what you’re up to, Snapchat is perfect. Those old friends and followers of yours may well be interested in your private jet charter business too! Bragging rights: There’s nothing that gets you more bragging rights than snapchatting live from your private jet. Whether it’s to show off to your friends, or to promote your image or brand, Snapchatting onboard a private jet is a great way to build an aura of success! To be part of the Snapchat community: There’s a lot of people out there on Snapchat, and a good chunk of them want to hear about your private jet charter business. Joining the growing community means making new friends, discovering new markets, and promoting your brand on a developing channel. It’s also a two-way process, so you might discover something you’re interested in as well! If you want some more inspiration for what you could be using the app for, check out some example Snapchats about private jet charters on Youtube. Be creative, get yourself and your business noticed, but most importantly, have fun!